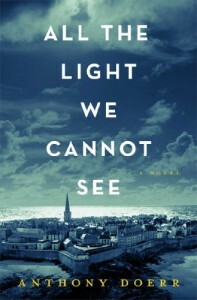 ALL THE LIGHT WE CANNOT SEE is one of the best books you’ll read this year. On one hand, the title implies the lessons learned boy about radio waves by a young German orphan boy. On the other hand, as the author describes it, “It’s also a metaphorical suggestion that there are countless invisible stories still buried within World War II.” Add in a newly blinded French girl who is forced to leave her familiar surroundings, and you’re in literary heaven. The layered meanings run deep in this book. No wonder nearly every advanced review used the word “intricate” to describe this masterpiece. The German boy and his sister discover an old radio, where they hear science lessons from afar. There are lessons about the brain, sitting inside the darkness of our skull, interpreting light; there are lessons about coal having been plants living millions of years ago, absorbing light, now buried in darkness; lessons about light waves that we cannot see—all applicable as the story unfolds. Readers will appreciate the short, almost lyrical chapters of alternating characters. The author helps by italicizing earlier mentioned quotes and then leaving almost every chapter closing with a message to ponder. Take for example: “a real diamond is never perfect”, “open your eyes and see what you can with them before they close forever”, and “the entropy of a closed system never decreases”. All of this is explained in a natural way, but never given out in an assuming manner. The story flows and draws your heart into its deep meaning. Having personal connections to both veterans of World War II and members of the blind community, I can attest to the authenticity of this story’s writing. Author Anthony Doerr brings out lovely characters, along with their own fascinations: seashell collecting, bird watching, locksmithing, electronics, and geology. The history surrounding these personal stories is real and deep. You will fall in love. I cannot attest how much this book means to me; I have been left awe-inspired. So, thank you to Scribner for making this book available for me to review. It has been an honor.